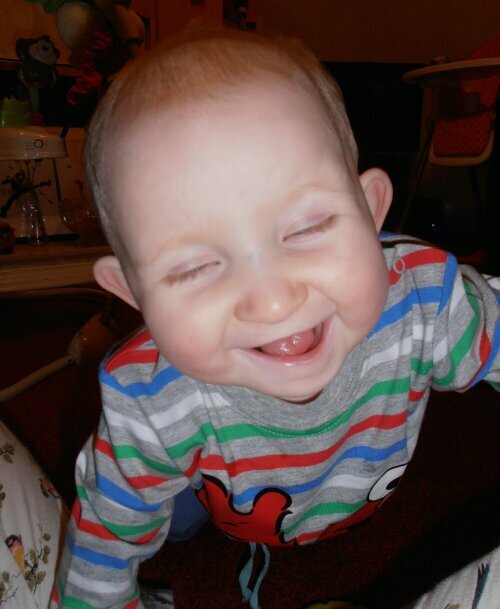 I’m making the most of kissing this cheeky face and playing together before I return to work. It gets me all worked up when people suggest I have a choice in this, I don’t, most of us don’t and for J and I it’s not good timing, we’re moving into a different napping routine, weaning isn’t yet fully established and frankly I don’t feel ready to leave her, but I have to, and we’ll both have to be brave together! On a positive note I believe we’ve found a good childminder, J is an adaptable little thing, and I’m sure a hot cuppa and adult conversation will do me good, I just don’t want to know about it if I miss her first steps, word or tantrum! 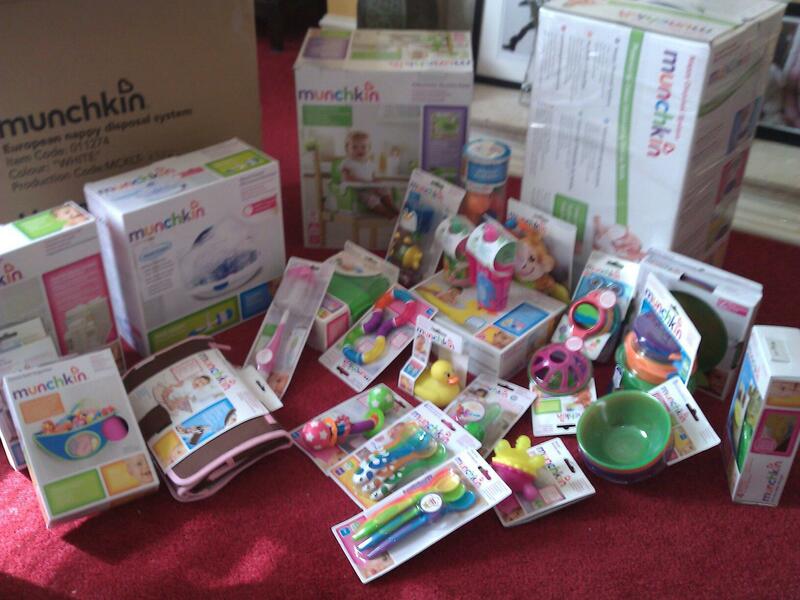 When I heard we’d been chosen by Munchkin to test their products I crossed everything that the booster seat would be in the product bundle as I’d been feeding Joss on my knee out at other people’s houses for way too long and she’d learned loads of tricks for wriggling away to play! 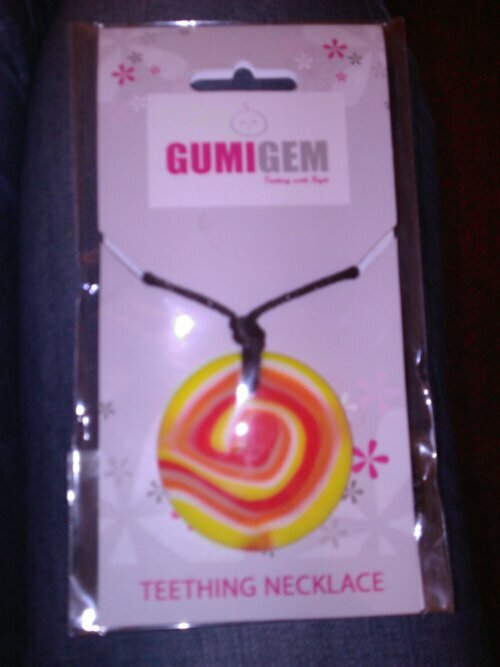 I was really pleased to see it in the mega box of products and knew we’d test that first! 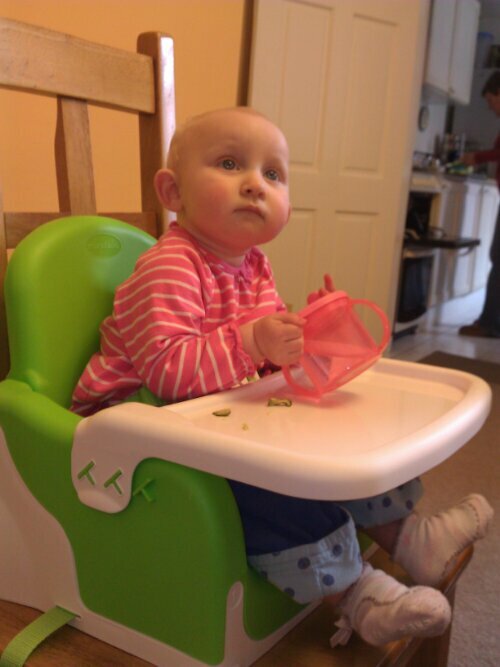 The practical things first – it has two seat heights and two positions for the feeding tray, can be attached to any dining chair but also used on the floor. The seat strapped easily to a large dining chair, the three point harness clipped easily and the first tray setting was a good fit even though Joss is skinny and usually too small for most seats! 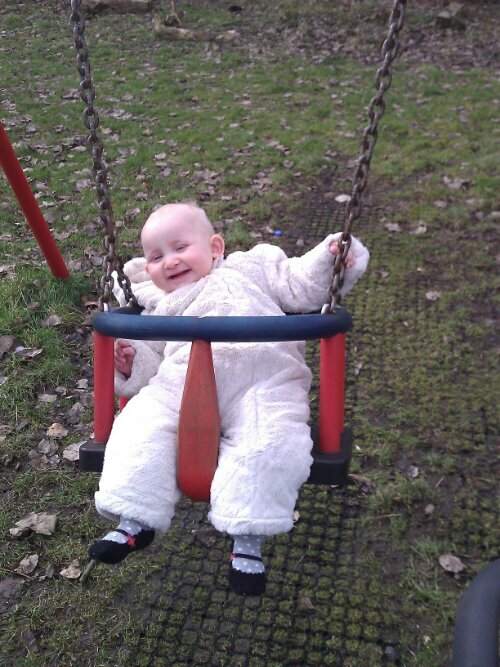 I was surprised how steady she was without straps over the shoulder but the seat was really robust. 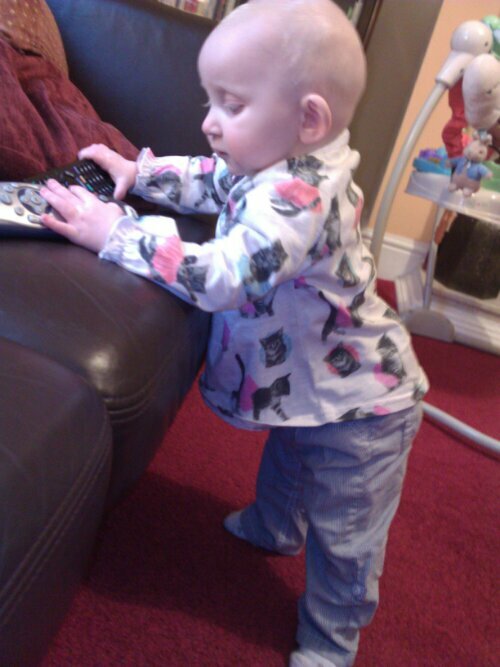 Even though we kept the seat on the lower position Joss quickly found she was boosted to a prime view of the TV and can be seen stretching to see here! 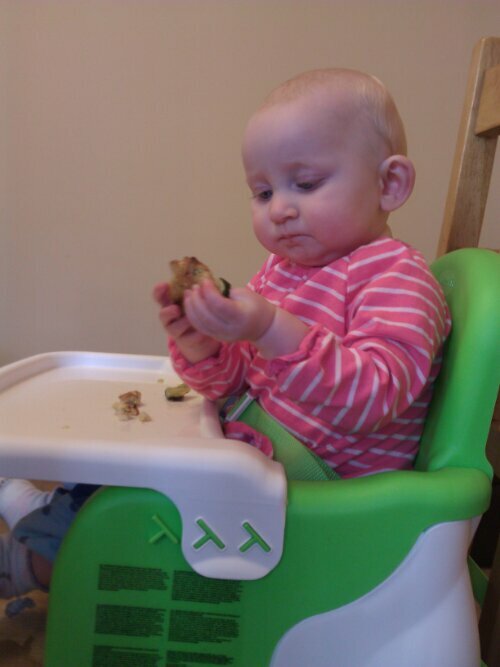 I love the vibrant green and sturdy chair back, Joss seemed really comfy and happily tucked into her cheese and courgette muffin, I think she liked eating with us as she could see our lunch and beg for bits and bobs from our plates! 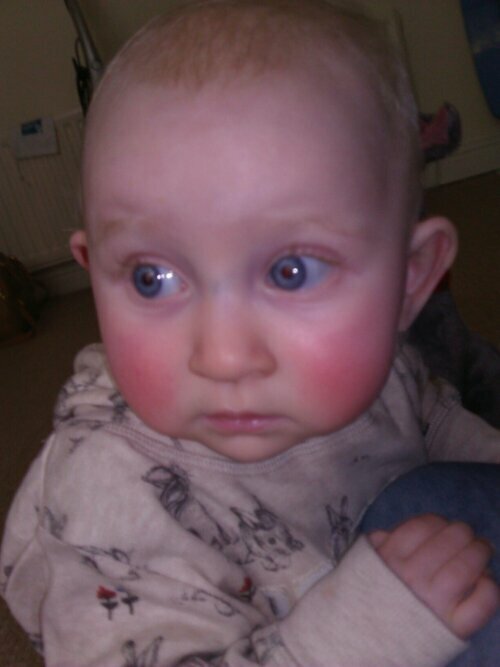 You can see here that although she’s a littley she was sat upright and comfortable. 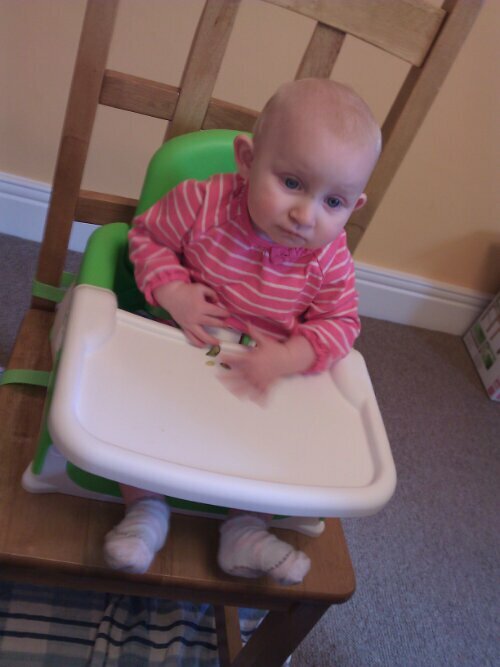 I was really impressed with this product, particularly as its priced at under £20 online and if we had dining chairs at home I’d have preferred this to our standard high chair, top marks from us!